Des Moines, Iowa - The Iowa Energy (26-23) won 103-92 over the Canton Charge (30-19) Friday night at the Canton Memorial Civic Center. With the win, the Energy keeps their playoff hopes alive. The Energy were led by Damien Wilkins with a game-high 39 points and five rebounds. Willie Reed added a double-double with 18 points and 11 rebounds. Arinze Onuaku led the Charge with 19 points and 11 rebounds. The Energy would never trail in the game. Iowa came out ready to play in the first quarter. They quickly jumped out to a 14-point lead over the Charge. The Energy would shoot 77.8 percent in the quarter to hold a 35-23 lead heading into the second. Wilkins led the Energy with 14 points on five of six shooting. Iowa continued to pour it on in the second, extending their lead to 22 points mid-way through the quarter to hold a 58-42 halftime lead. Wilkins had 21 first half points. Iowa continued to control the game in the second half behind strong performances from Wilkins and Reed. Canton was able to get within seven points of the Energy in the closing minutes of the third quarter. Iowa quickly responded and opened back up an 11-point lead to take an 81-70 advantage into the fourth. Iowa was able to cruise to victory in the fourth winning 103-92. Iowa remains locked in a battle with Fort Wayne for the final wildcard playoff spot in the Eastern Conference. The Energy return home Saturday for the regular season finale against the Maine Red Claws at 7 p.m. for MidAmerican Energy GO GREEN night. The first 500 fans will receive a Surge bobblehead. Iowa Energy 2014-2015 single game tickets are now on sale starting at just $8. 2015-2016 season tickets are on sale starting at just $299. For more information, visit IowaNBA.com or contact the Energy at (515)-564-8550. 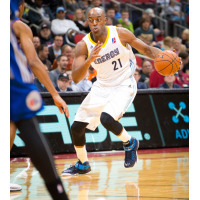 For more information on the Energy, 'like' the Iowa Energy on Facebook or follow on Twitter (@iowaenergy).